Serena Ryder at Del Crary Park. Now in its 21st season, the Peterborough Summer Festival of Lights is a free outdoor concert series presented by the city of Peterborough and corporate sponsors every Wednesday and Saturday night throughout the summer. While the lineup has a definite lean toward MOR, easy listening, and classic rock it has also featured some rock and pop stars. 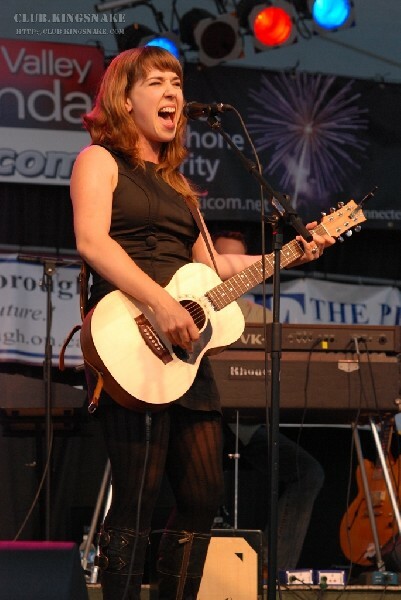 The must-see concert for me this year was Serena Ryder. 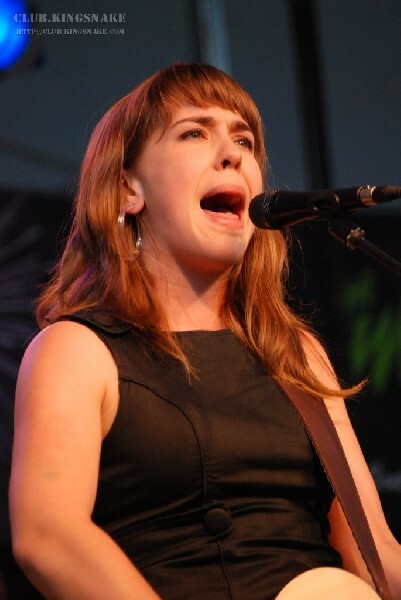 Since her discovery by Hawksley Workman, Serena has become a local Peterborough girl done good. I'd been aware of Serena for a number of years. An aunt of mine had taught her in high school and they'd been espousing her virtues for the last several years. Amazingly my first chance to see her live came earlier this year in the whirlwind that is Austin's South By Southwest. I was enraptured during her short solo set and added her to my mental list of artists to see again. It's not often that I get to take my entire family to work with me, but Serena's show seemed the perfect opportunity to take my wife and my music-loving children out to see a show that I was photographing. My four-year-old son fell asleep during Serena's first song (it was an hour-and-a-half past his bed time), and after I was done shooting I took our 16-month old for a walk so he could do the same. Our six-year-old fancies herself as a vocal stylist (and rightly so) and was enthralled thoughout the performance. I'm sure this was a great homecoming for Serena. She herself admitted it was difficult to not just stand on stage waving and saying hi to all the familiar faces in the crowd. On this night in Peterborough, Serena had brought a band with her and was joined by them for probably half her set. The 90 minute set included several selections from her latest full length release, If Your Memory Serves Your Well, as well as older originals and a Fleetwood Mac cover. "Weak in the Knees" was featured and is a beautiful original song that I'm often humming for days after every listen. But, where Serena shines is during her solo pieces. Performed acapella to finish out her set, "Melancholy Blue" and "Sing Sing" can, within the duration of each song, stun an audience into silence and bring it to it's feet. That's just what she did under the stars in Peterborough.